KO Kid Lama Ready For Studzinski Test On June 1st. 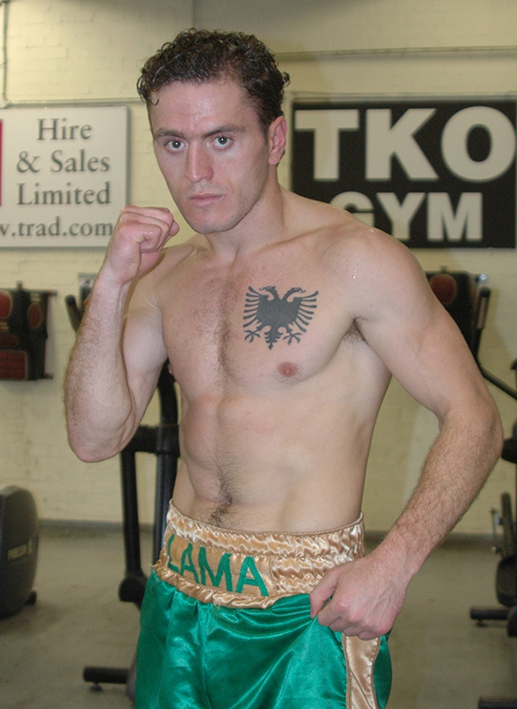 TRAD TKO’s London based prospect Festim Lama gets his second pro outing, on Johnny Eames’ TKO Events promoted ‘Two Tribes’ show at York Hall in Bethnal Green, London this coming Saturday, the 1st June. On his pro debut, back in February, Lama impressed the York Hall crowd with his no nonsense approach to the noble art. The 23 year old comfortably controlled Didier Blanch, from a centre ring position, before sensationally stopping the Newcastle man, with a vicious body shot, early in the third round. Anyone that had followed Lama as an amateur wouldn’t have been surprised at the way he clinically disposed of Blanch, as it seems to be par of the course for the youngster. As an amateur Lama only fought about 20 times, only losing once, the win ratio is first class but the statistic that is most impressive is that around fifteen of those wins was by way of stoppage. Following a training session earlier today Lama took a little time to talk about his upcoming fight, against Robert Studzinski, as well as his previous win over Blanch. “It’s going to be a strong fight and if he goes for a knockout I will fight him back to the death, you know, so we see how it goes. My first fight, I knock him out in the third round with a body shot, stoppage, so I win that. Training’s been going very well, have good trainer, Mo Hussein, I feel comfortable with him, I feel good working with him, I have been learning a lot from him. Well, I’ve been sparring the Turkish lads, brothers Onder and Shiya Ozgul, and Erick Ochieng, he’s English Champion I think, I sparred him last week. Festim Lama feature on the undercard of Colin Lynes versus Beka Sutidze, which headlines the Johnny Eames promoted ‘Two Tribes Go To War’ event at York Hall in Bethnal Green, London on Saturday 1st June 2013.